Clint Finch purchased his first Our Town America franchise territory in 2005, after working as a sales representative for a majority of his career. What is his key to success? Be excited about the product you are selling. 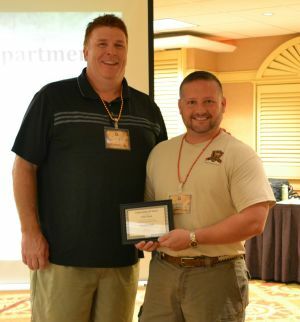 This year, Clint was named as an FBR Franchisee Rock Star. What advice do you have for someone considering investing in a franchise? DO IT! But don’t think that because you own a business that you are going to just make money! It takes work and discipline. There is no one there to check that you are working. It is really up to you to go out and make it work! What are you most proud of when it comes to your career in franchising? We have grown to a top franchisee group in our company and we get to spend time helping and training others who are coming in. It is humbling to know that other business people respect and admire your work. What was your career path before you entered franchising? I was climbing the corporate ladder. From the beginning as a Sales Representative and working my way up to VP of Sales in several organizations. As a business owner, what has been the biggest challenge you've had to overcome? Expecting everyone to be as excited as I am about my products. I have learned to accept that others might not see the benefit. However, so many people do, and I will continue to find those people! A second challenge has been keeping my work-life balance. Getting carried away with work seems easier when it is your own business. What do you like most about your franchise organization? Total support from each and every person at our corporate office! It is more than just the systems in place, which are also fantastic. We also enjoy a great group of franchisees who care about and support each other. To learn more about an Our Town America franchise, request information here.